Ada Leverson, née Ada Esther Beddington, was the eldest of nine children in a cultivated, liberal, assimilated Jewish family in London. Her mother was a pianist and friend of well-known musicians such as Paderewski and Puccini. In 1881, Ada married Ernest Leverson, a wealthy diamond merchant 12 years her senior, and the couple had two children. However, the marriage was unhappy and ended in separation; it also provided material for many of her novels. Ada began her literary career by contributing witty sketches, parodies, and stories to newspapers and magazines. 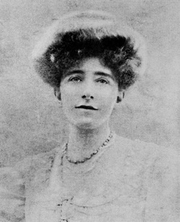 Her first novel, The Twelfth Hour, was published to acclaim in 1907. After her husband's death in 1922, she sold her London house and spent part of each year in Florence. Her wide circle of friends included the three Sitwell siblings, composer William Walton, Harold Acton, and other members of the British colony in Florence, as well as Somerset Maugham and T.S. Eliot. She remained a devoted friend of Oscar Wilde through his criminal trials, imprisonment, and exile --his fond nickname for her was "The Sphinx." Ada would come to be considered the muse of the aesthetic movement of the 1890s, and her own works provide valuable insights into the English society of her day. Ada Leverson's book Love's Shadow was available from LibraryThing Early Reviewers. Ada Leverson is currently considered a "single author." If one or more works are by a distinct, homonymous authors, go ahead and split the author. Ada Leverson is composed of 2 names. You can examine and separate out names.